The Nasdaq is closing on the 5,000 for the first time since 2000 thanks to some hot, brand-name tech stocks. The Nasdaq last topped the 5,000 level in March 2000. It's the only major market barometer that hasn't hit a new all-time high recently. But the Nasdaq is now just 7% below its record close. If this explosive stock rally continues, the tech-heavy index could get back to the 5,000 mark before the 15th anniversary of its peak. In a story I did for CNNMoney in March 2004 about tech stocks, I had a poll asking readers when they thought the Nasdaq would get back to 5,000. Nearly 25% of the respondents said never. It's been a long time. To put in perspective just how long it's been since the Nasdaq's glory days -- and how much has changed in tech -- consider the following. A 30-year old trader or investment banker (who's no longer young enough to be considered a Wall Street rookie) was still in high school the last time the Nasdaq was above 5,000. Taylor Swift was only 10 years old, and music fans were still trying to figure out whether it was okay to download Metallica songs for free from Napster. Facebook (FB), currently one of the most valuable companies on the Nasdaq, did not yet exist. Mark Zuckerberg was still months away from his 16th birthday. Apple (AAPL) was a struggling computer maker that Steve Jobs was trying to turn around. There were no iPods, let alone iPhones and iPads. Google (GOOGL) was still a private company whose search engine was only recently out of beta status while Amazon (AMZN), eBay (EBAY) and Yahoo (YHOO) were plucky upstarts on Wall Street. AOL (AOL) was the dominant Internet company, having just announced plans to merge with CNNMoney owner Time Warner (TWX). What now? So should investors be worried that tech stocks are approaching the bubble levels from the dot-com boom era? Perhaps. There are some eerie similarities to the late 1990s and early 2000, especially when you look at the start-up scene. It's fair to wonder if hot private companies like Uber, Snapchat, Airbnb and Dropbox are really worth more than $10 billion. But Eric Jackson, managing partner of hedge fund Ironfire Capital, says today is nothing like those days. "We're far from the craziness," he said, recalling how traders were even more fixated on CNBC than they are now and were cheering when companies with no profits like Theglobe.com and VA Linux were going public and soaring more than 600% on their first day of trading. That makes the 38% pop for Alibaba (BABA), a profitable company with a 15-year track record, seem tame in comparison. "I'm not ready to hit the alarm bell and panic about a bubble just yet," Jackson said. 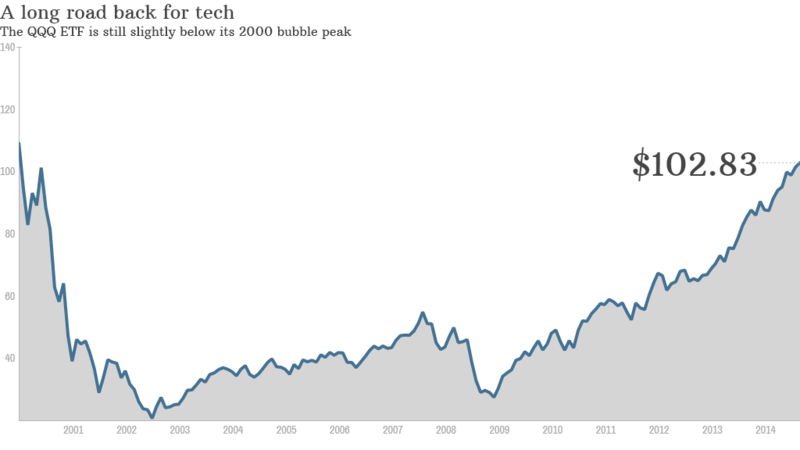 Ted Parrish, co-manager of the Henssler Equity fund, said that already public tech stocks are now more reasonably valued than they were 15 years ago. Microsoft (MSFT), Intel (INTC) and Cisco (CSCO) are now all stodgy members of the Dow, for crying out loud. Tech bust survivors who are still alive also endured the Great Recession. They are clearly viable companies with staying power. And many of them even pay dividends now. Tech has grown up. "There is more stability in tech," Parrish said. "The leading companies are here to stay. I don't see another depression in tech stocks anytime soon." His fund owns quality companies like wireless chipset maker Qualcomm (QCOM), which Parrish said he thought was overvalued in 2000, as well as Apple. He also owns Chinese search engine (and Nasdaq-listed company) Baidu (BIDU). Still, there are risks to buying tech at these levels. Jackson said it's getting harder to find tech stock values. And those who are not old enough to remember 2000 need to realize that when bubbles pop, it can take decades to recover. While Microsoft, Apple and several other tech leaders of today are trading at higher prices than 15 years ago, Intel and Cisco are still well below their 2000 peak prices. If you were unlucky enough to have bought the PowerShares QQQ (QQQ) exchange-traded fund, an ETF that tracks the top 100 non-financial stocks in the Nasdaq, on March 10, 2000, you'd still be in the red on that investment. But Parrish said it's a good sign that tech stocks haven't bounced back as quickly as the broader market. The valuations were so extremely high back then, it would have been unreasonable to expect a quick rebound. 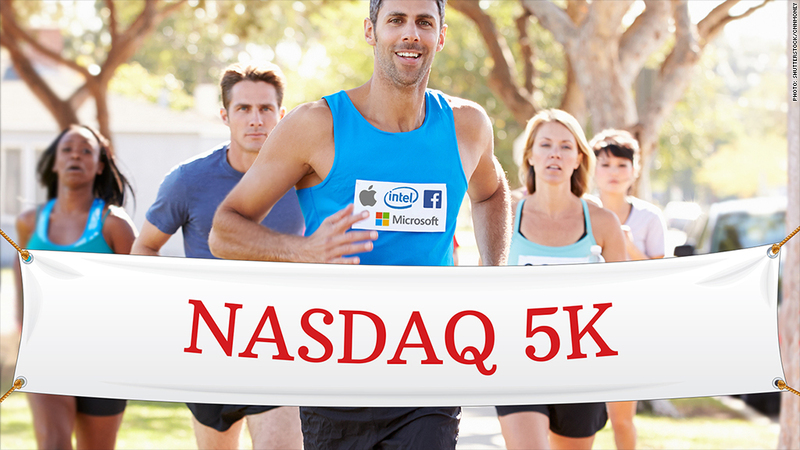 "The Nasdaq getting back to 5,000 is bound to happen eventually," he said. "But I'm glad that it's taken this long. It would have been dangerous if it had happened sooner."